Artistry, Passion and Love for nature and her Greek heritage are at the intersection of this eye-catching, one of a kind olive leaf pendant designed and handcrafted exclusively for Gala 2019 from the heart and hands of artist Mata. 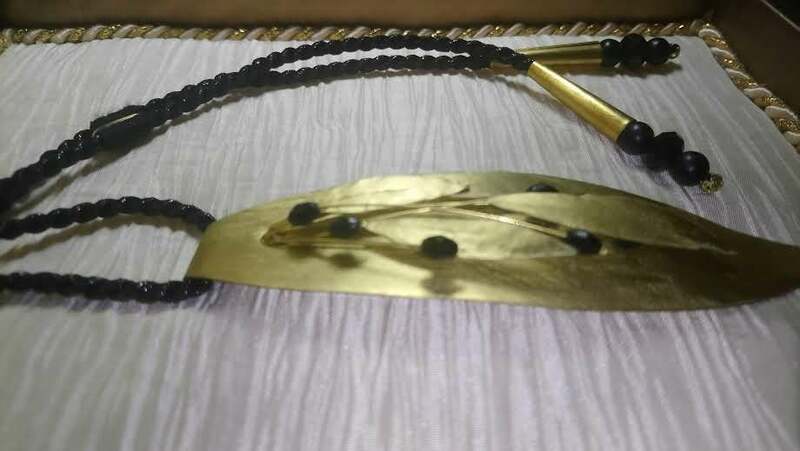 Hammered out of brass metal sheet, the artist shaped five small olive leaves, layered them atop a larger one and adorned them with onyx beads for a bold earthy and primal look reminiscent of Ancient Macedonia and Greek Hellenistic jewelry making techniques. The number “5” symbolizes God’s grace toward humans and is mentioned numerous times in the Bible. The Pendant is 3” long and 1” wide and hangs from a black silk cord with brass fittings and beads. Drop can be adjusted from 16” to 26” for different looks. It is safe to be worn on skin. The metal is sealed and cured to prevent allergies and skin discoloration and protect from tarnish, oxidation and fading. This one of kind necklace is boxed in an elegant, handcrafted jewelry case covered in rich crepe satin and embellished with same tone and gold cording and feathers. 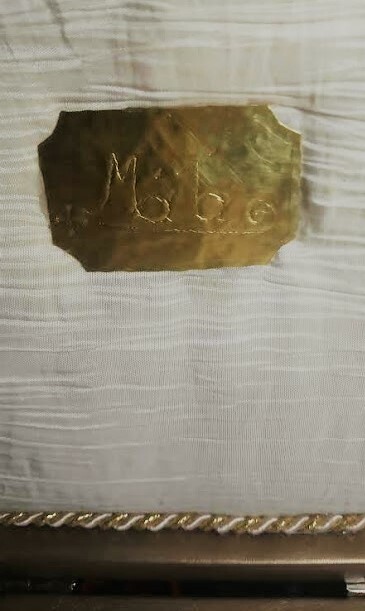 The artist’s signature logo brass plaque adorns the cover. “The olive branch, a symbol of peace and prosperity, came first in mind when I was commissioned to create a one of a kind piece of jewelry for St. Nicholas’ Project 2020 Gala. My heart and mind painted a picture of a Hellenistic design using brass and black onyx stones." Stamatia Koukousoula, known in jewelry making art circles as Mata, is a Greek artist who specializes in creating limited edition pieces. Her career spans more than 20 years. Her favorite media are metal, beads and textiles. Her signature style is to incorporate and “weave” elements of traditional hand working Greek Art (crochet, fabric embellishments and bead work) into her designs. Mata’s source of inspiration is mother nature; the vibrant green hues of the forest and the intoxicating blue and turquoise of the Greek seas. Although Matta’s primary passion is jewelry making, she has successfully experimented with textile design and has infused and transferred her diverse talents and sense of aesthetics to wedding and home décor.